Entering the final stretch of the regular season, the Oregon men’s basketball team needs tough wins on the road. The Ducks survived a late rally by USC Wednesday night, defeating the Trojans 80-75 at the Galen Center in Los Angeles. The Ducks won their fourth straight game and improve to 18-7 overall (8-4 Pac-12), completing their series sweep of the Trojans, who remain at the bottom of the conference at 9-15 (1-11 Pac-12). Joseph Young and Pac-12 Player of the Week led the Ducks with 26 points. Joseph Young led the Ducks with 26 points, following up his outstanding performance against Washington State and Pac-12 Player of the Week honors with another dominating offensive clinic. Freshman Dillon Brooks and junior Elgin Cook both contributed 15 points. Cook had 7 rebounds and six assists. Jalil Abdul-Bassit and Jordan Bell both had 8 points. Bell’s return provided the Ducks’ defense a huge lift as the freshman grabbed four defensive rebounds, one steal, and one block. Bell currently has 72 blocks on the season. Oregon jumped out to an early lead 8-2 thanks to quick baskets by Bassett and Cook. By halftime, Oregon led USC, 35-27. Despite the lead, the Trojans marched out of the locker room and with 16:49 remaining in the second half, tied the game, 41-41. Julian Jacobs led the Trojans with 18 points, six rebounds, and six assists. But a reinvigorated USC squad didn’t have an answer for the dynamic play of Young, who responded to the Trojan’s surge by scoring seven points in less than a minute. From that point forward, the Ducks refused to relinquish the lead. After the game, Oregon head coach Dana Altman said his team started the game playing good basketball, but came out flat in the second half. Oregon shot 58% from the field with three Ducks scoring in double digits. Despite a good shooting night for Oregon, Jacobs helped USC pull within three, 76-73, giving the Trojans a chance to tie with a minute remaining. Oregon’s defense ultimately held on, securing the Ducks’ an important win on the road. 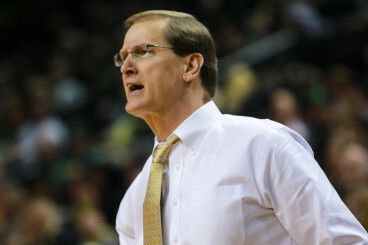 Under head coach Dana Altman, Oregon has won 115 games over the last five seasons. Strong, consistent defensive play remains a sore spot for the Ducks and something that has to improve for Oregon to accomplish its postseason goals, and it’s something Altman has preached all season long. In the big picture, the Ducks have only strengthened their case as they look for an outright NCAA tournament bid. Next up, Oregon will face UCLA on February 14th at Pauley Pavilion.